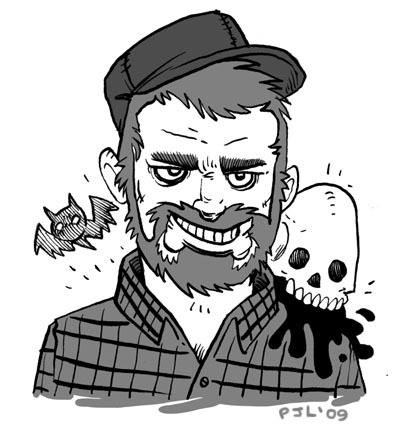 Self portrait of Peter Lazarski, Imaginary Monsters creator! Congratulations, dude! 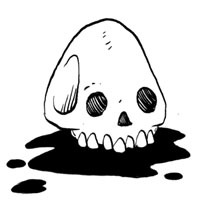 You have just discovered ImaginaryMonsters.com, home of awesome webcomics! Grab a sandwich and your d20 and get ready for skulls, necromancers, slime, bats, monsters, belligerent knights, dungeons, and more sandwiches. My name is Peter Lazarski and I am the creator of ImaginaryMonsters.com. I’ve been making Imaginary Monsters stuff since 2005 and I’m doing my best to keep the brand healthy and alive by constantly making cool new things for people to enjoy. You’re probably here to read the awesome Imaginary Monsters webcomic I have going (which is great!) but know that that’s just the start of what this website will feature. ImaginaryMonsters.com is going to be the home for all of the cool stuff I make, so stay tuned for updates on books, zines, and screen printed things I have made and will be making. In the meantime, if you’re interested in seeing more of my concept art, illustration and design work you can head over to peterlazarski.com. You can also check out my etsy shop at imaginarymonsters.etsy.com if you want to pick up some sick posters or some gnarly zines. Peter Lazarski lives under a log in rochester, ny. While under his log he draws comics, monsters and pretty girls with bad haircuts. He also designs things, screen prints more things, and reads. I just wanted to let you know that I love your work. I stumbled across it while googling images of red and blue oni. You’re a very good artist and I love how upbeat your comic is. It’s clear that you really love monsters and table top games and aren’t just referencing them to be hip and cute. Thanks for sharing your art with the world! Thanks very much! I really enjoy making this comic and I do love monsters.